The Village of Union Grove is seeking a part-time groundskeeper to prepare baseball and softball fields. Duties involve basic upkeep of athletic fields, field layouts and line marking. Normal schedule is 4 hours per day, Monday-Friday, from May through mid-July. Compensation: $9-$12/hr, depending on qualifications. To apply, submit an Employment Application to Village Hall, 925 15th Ave., Union Grove, WI 53182. Position is open until filled. The Village of Union Grove Department of Public Works has openings available for (2) college/technical students seeking employment during the summer of 2019. The primary focus will be lawn care, park maintenance, brush pickup, cleaning of equipment, painting or other work with the streets department, wastewater utility or water utility as assigned. Qualifications: Students who have completed their senior year of High School and are enrolled in post high school education for fall of 2019. Candidate shall possess a valid Wisconsin Driver’s License to drive pickup trucks or a single axle 1-ton truck. Candidates will need to be able to work with various pieces of Village equipment such as a Zero Turn riding lawn mower, weed wackers, brush chipper and other pieces of equipment as assigned. Work Hours: 6:30 am to 3:00 pm with a lunch break from 12:00 pm to 12:30 pm. Compensation: Hourly 40 hours per week at $10.00/hr. 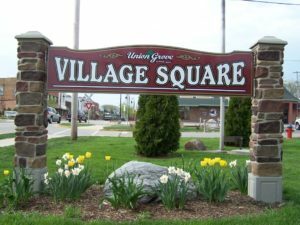 Applications: Candidates should submit the Village of Union Grove Employment Application and contact information for (3) references to the Director of Public Works, Richard Piette, by e-mail to rpiette@uniongrove.net. The Union Grove Employment Application can be downloaded by clicking here. Conditions of Employment: Selected candidates must pass fit for work physical, alcohol/drug screening and background check prior to first day of employment. The Village of Union Grove is looking for substitute crossing guards. If you are interested, please come into the Village Hall Monday – Friday between the hours of 8 a.m. and 4:30 p.m. to fill out an application. If you have any questions, please call 262-878-1818. Click here to download the Employment Application Form. (262) 878-1818 | Monday – Friday 8:00 a.m. to 4:30 p.m.